THE fact that the iceberg has settled itself outside the tiny village of Innaarsuit may be of definite concern, if it decides to flip causing a tidal surge. 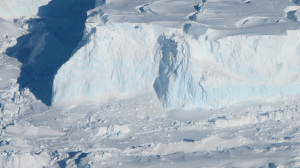 But, to blame global warming, while not surprising from the fake news media, is dishonest to the phenomenon of glacier calving – a natural and dynamic process that’s been happening for eons. THE glacier-calving process more likely reflecting the very health of a glacier. CERTAINLY true for Greenland, from where this particular iceberg originated, where over the past 19 months more than one trillion tons of new ice has formed on the giant ice-continent’s surface. DUE to a lot more new snow accumulating each year during the long winter, than is melting during the short summer, the surface is rapidly gaining ice, and glaciers are growing.